April 1, 2013 – Colorado Springs – USA Cycling, the governing body for competitive cycling in the U.S., announced today that they have been purchased by NASCAR, the auto racing conglomerate. “We feel that the sale will help elevate competitive cycling in the U.S. to the level of stock car racing,” said USAC Board member Bill Smythe. “NASCAR tracks are perfect for holding bike races, and the sale will facilitate the creation of two new series: the NASCAR Spring Sprints, and the Circular 200 series.” The races will be held on, and sometimes during large NASCAR events like the Daytona 500. NASCAR brings 66 years of success in promoting stock car racing to the sport of bike racing. “We think the addition of beer, whiskey, Southern rock, and the middle American demographic will turn bike racing into a marketing powerhouse,” said Allan Allez, president of the NASCAR fan association. 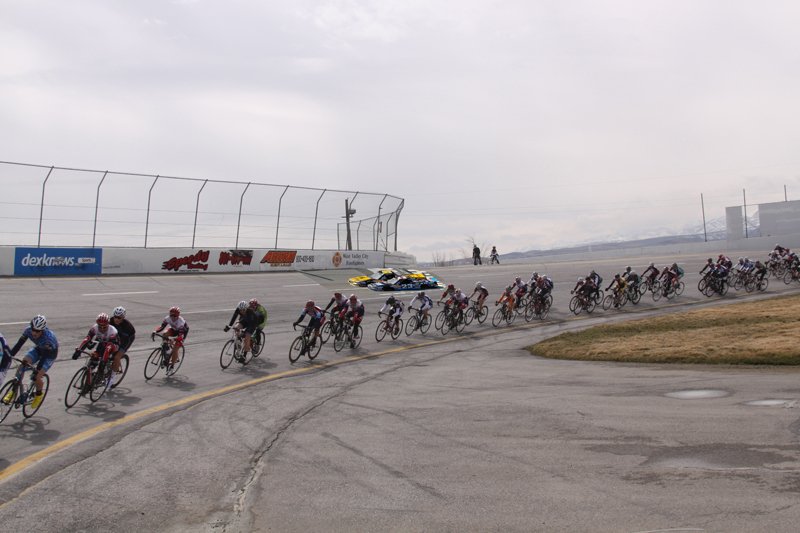 “While holding a bike race during a stock car race may seem crazy, we think that the addition of 200 mile stock cars on the outside of the track mixed with the elegance of 33 mile an hour bike racing is a perfect mix. Pit crews will be able to service cars and bikes. It will also allow the extension of stock car sponsorships to bike teams, bringing long needed stability to the pay of competitive cyclists.” In a coordinated campaign, Shimano has released the new pneumatic quick-release. The new skewer is designed to work with the high torque impact wrenches used in NASCAR pits. The trademark ‘Whirrrr’ sound created by the wrenches is sure to be associated with bike racing for years to come. Just prior to the sale announcement, USAC declared that grassroots cycling will be spun off into an autonomous member owned decentralized anarchist collective. “We’ve had enough of the noisy membership base, and we decided to let them govern themselves. They’ve been telling us for years that they want member control, so we say, have at it,” said Smythe. The new organization, Socialist Autonomous Anarchist Cycling Collective, or SAACC, will be governed by a rotating ‘leader’ with real time internet voting on new initiatives. The ‘leader’ will really be more of a workshift manager, doling out committee assignments, officiating, and the like (noting of course that winners of races will now be determined by realtime™ voting through the new SAACC cycling app. Licenses are being discontinued, replaced with new collective member cards. Riders will no longer be categorized, but rather given neutral color ratings (Red, Orange, Yellow, Blue, Indigo, Violet), with rider speed tied to light frequency. “The old system was too repressive, numbers are too orderly. Colors are better tied to the ride experience and rider feelings rather than ability,” said SAACC color specialist who goes by the name Salmon. “Rules are out of date, so capitalistic. Expect more color-centric cycling. Feelings will guide the way races are put on.” The new plan will also affect UCI Rule 1.2.019, which USAC has recently used to ban pro cyclists from local grassroots, non-USAC events. No longer relevant, entry to all races will be allowed if racers declare a color at race start. Expect Blue and Orange to dominate. The sale and spinoff is expected to result in a resurgence for competitive cycling. The elite interests that have governed the sport for so long will now get the financial backing needed to bring cycling into almost every living room and bar in America and the opportunity for the ‘Whirrrr’ sound of the impact wrench to be forever associated with cycling. Grassroots racing advocates will find great peace of mind through self-rule and color therapy. Editor's Note: No facts are included in this article. All is fabrication, parody, satire, etc. 2 Responses to "USA Cycling Purchased by NASCAR"